Atop Snow King mountain in Idaho, sits a new radio tower providing Internet access using new WiMAX technology. But it can do more than that. KIFI News Group calls it WiNG or Wireless Internet News Gathering. KIFI News Group General Manager, Mark Danielson, says, "The WiNG project is based on using the Internet to send content (video and sound) from the scene of a news event back to the station for LIVE broadcast on its television stations and web sites. Danielson says, “The breakthrough is the ability for KIFI field crews to send near Broadcast Quality LIVE shots over wireless Internet." Pioneering work on adapting WiMAX for ENG is now underway at KIFI, News-Press & Gazette’s ABC affiliate in Idaho Falls, Idaho. And so far the fourth-generation wireless broadband access service is showing a lot of promise. "This opens up a whole new world," says Mark Danielson, general manager of the KIFI News Group, who has dubbed its system Wireless Internet News Gathering or, simply, WING. Unlike so-called third-generation, high-speed mobile technologies like EVDO, WiMAX can provide enough upstream bandwidth for live video. It’s not the best, but it is "definitely acceptable," says Danielson. "Most viewers probably couldn’t tell you we’re doing anything different." Danielson can tell you about the difference in cost. Satellite is out of the question for the nation’s 163rd largest market. Outfitting a microwave truck costs about $200,000. But KIFI spent just $12,000 to equip a Toyota Highlander SUV with the necessary hardware and software to send video via WiMAX. "Plus, I don’t have to have any receive sites," Danielson says. "I just have to be in a place where WiMAX exists with Digital Bridge." Digital Bridge Communications is the local WiMAX service provider, with which KIFI has been closely working. 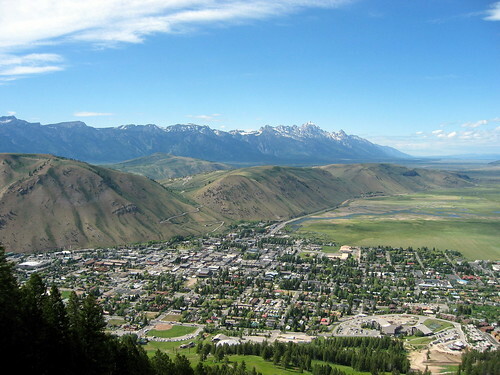 Its BridgeMaxx service covers much of the same ground as KIFI: Idaho Falls, Pocatello, Twin Falls, Rexburg and a number of towns in Sun Valley. "This is a unique product that was developed for them," says Doug Smith, Digital Bridge’s CIO. "This was a first for both of us and one of the first, if not the first, instances of doing broadcast over WiMAX in the U.S. that I’m aware of." Broadcasters elsewhere may soon be able to experiment with live video via WiMax. Using spectrum mostly in the 2.5 GHz band, WiMAX is just getting started in the United States, and it is expected to pop up in markets across the country over the next few years. The big player is (or will be) Clearwire Corp., a planned joint venture that will include some of the biggest names in telecom and high tech: Sprint Nextel, Comcast, Time Warner Cable, Bright House, Google and Intel. Sprint Nextel, which will own 51 percent of the venture, is folding in its Xohm WiMax unit, which launched a commercial service in Baltimore just last month. If it all comes together, Clearwire expects to roll out WiMAX service in markets covering about 140 million people by 2010. But what works in one place may not work in another. In Idaho, KIFI and Digital Bridge worked out a "special priority service" that guarantees KIFI 2 Mbps upstream throughput when needed for a live shot. A guaranteed upload speed of 2 Mbps is unusual for broadband wireless service providers. Typically, they offer such speeds only for downloads and much slower upstream bit rates for keystrokes, e-mail and occasional peer-to-peer traffic. A news operation, of course, works the other way. It needs only small swaths of downstream bandwidth and huge chunks for sending video back to the studio. Cutting a deal for the fat upstream pipe may not be possible everywhere. As the service becomes popular, it will be more difficult for a station to set up the sort of sweetheart deal that KIFI has with Digital Bridge. Even in Idaho Falls, the priority service is only available for regularly scheduled newscasts. "My verbal agreement with them is around news time," said Danielson. "We’re learning that their peak time also happens to be around 4 in the afternoon. It’s become complicated for them, but they’ve been able to deliver." A wireless service provider could be forced to choose between the larger group of customers — some of whom are corporate and paying huge fees — and a steady paycheck from a news operation. Raycom Media, the station group based in Montgomery, Ala., is intrigued by the KIFI experiment. David Folsom, vice president-CTO at Raycom Media, says he will probably give it a try in Lubbock, Texas, the only Raycom market where WiMAX is going to be available. A company called Xanadoo is building a system there using licensed 2.5 GHz spectrum. "The biggest hang-up at the moment is that nobody has created the glue yet for it," says Folsom. "You have a modem and a laptop and a camera but that doesn’t necessarily make a remote facility. You need all the parts and pieces." Nobody knows that better than KIFI, which had to assemble its system form parts and pieces. Key pieces come from Steambox, a Seattle-based company that specializes to pushing video over IP networks. It’s supplying the software that runs on a laptop and encodes and compresses the video for WiMAX transmission as well as the decoder that receives and processes the signal for broadcast back at the station. "It really became a three-way partnership between us, Digital Bridge and Streambox constantly modifying and make this technology work," says Danielson. "There really are no blueprints for doing what we’re doing yet." "We’ll see long term whether the QoS [quality of service] holds up," says Folsom. "The people in the field are not IT people; they’re reporters. The issue is the human interface part and we’re working on that right now." Danielson maintains that using WiMAX is not that tough, even for the non-technical types. "They have a camera, a BridgeMAXX modem, a converter box … and a laptop computer with the Streambox encoder software. You look at the truck and go, ‘That’s it?’ There’s nothing to it. It’s simple. There’s no 40-foot mast to worry about." Aside from the quality of the signal, Danielson’s biggest worry is latency of about three interminable seconds in the talk-back between the studio and the remote site. "We compensate by cueing the reporter about a second-and-a-half before the anchor is done talking," Danielson says. "As far as having audio and video in sync, we have not had any of those issues." In any event, Danielson and Folsom agree that WiMAX is a step up from EVDO, a widely available wireless access service that has been adopted by many broadcasters for sending video, but only when satellite and microwave isn’t possible. Folsom says he doesn’t depend on EVDO for live shots. "We use it for those circumstances in which there’s no other way we can do it because we’re out of our normal microwave footprint or there’s some other overriding reason like the weather. "I don’t suggest for a minute that EVDO is competing with WiMAX at all, but since WiMAX’s footprint is so tiny right now and EVDO is everywhere, we’re using Verizon EVDO+ and it’s been fairly decent for us," says Folsom. "I don’t have a lot of complaints." While EVDO is improving, Danielson won’t go that way again. EVDO can’t promise bandwidth, he says, noting that an upstream throughput of 1 Mbps is considered a stretch. At least for the present, KIFI sees WiMAX as a complement to microwave, not as a substitute. "We still rely heavily on microwave for our primary system. The only downside with microwave is it’s line-of-sight to your receive towers," he says. Eastern Idaho is mountainous so there are many spots that are out of microwave range of the station. That’s where WiMAX can help. "BridgeMAXX is more like cellular technology where any place you’re within a radius of a WiMAX tower you have the ability to send," says Tory Willmer, KIFI’s IT manager. That Eastern Idaho is also sparsely populated helps, Danielson adds. Even though its spectrum is licensed, WiMAX, like any radio service, is susceptible to interference, he says. So the more remote the place, the less the chance of interference. WiMAX is one of two fourth-generation mobile wireless technologies. LTE, or Long Term Evolution, is coming on the heels of EVDO and other third generation services and, while still several years away, promises a more ubiquitous coverage and faster upstream service. But WiMAX is here now. "It’s a great application for broadcast," says Danielseon. "I predict this is going to be the way things are done in the future. You could have a fleet of WING vehicles with WiMAX at a fraction of the cost of a couple satellite trucks or live trucks." This entry was posted on Thursday, October 30th, 2008 at 8:24 am	and is filed under Uncategorized. You can follow any responses to this entry through the RSS 2.0 feed. You can leave a response, or trackback from your own site.